Live the downtown city life in one of Americaâs fastest growing cities! This loft style luxury condo has dramatic 27 foot floor to ceiling windows with electric blinds. Hardwood floors, stainless steel appliances, granite throughout bathrooms and kitchens accent this loft. Enjoy cooking at home with a gas stove in the large great room and kitchen while you entertain downstairs. An extra powder room is on the first floor. A Spiral staircase takes you to the master suite loft with a large bedroom with plenty of room for a desk or additional sitting area, a full bath with large soaking tub, large walk in closet, and large laundry room with plenty of storage space. Watch concerts in downtown Lake Eola park right off your balcony. The best state-of-the-art amenities in downtown with a huge gym loaded with anything you would need. Tennis Courts, basketball courts, yoga room, grills, and a rooftop pool are located on the 7th floor. 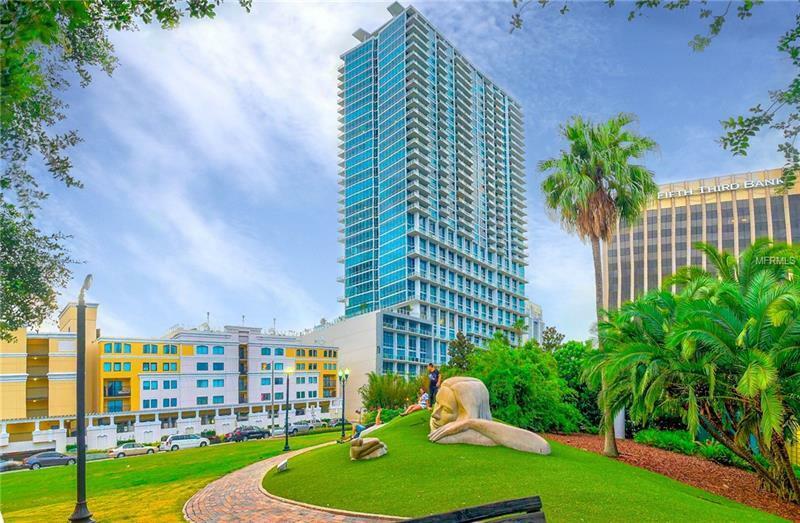 24 hour security, fingerprinting entry, concierge services, a theatre room, and a huge Community Center with great views of Lake Eola enhance the community. Available financing as low as 5% down in the building. The city life is calling your name at The Vue at Lake Eola in downtown Orlando!